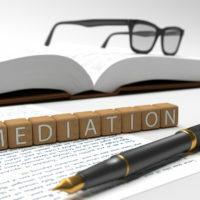 Mediation can be a less-expensive and less-combative way to resolve your divorce, but many divorcing spouses view it as a mere formality before the “real” divorce trial begins. However, couples who take the mediation process seriously may find that they can reach a settlement without having to go to court. Even though mediation doesn’t require quite the same level of preparation as does a trial in a courtroom, it’s still important to develop a game plan and establish your expectations for the mediation session. Read on to learn about how best to prepare for a divorce mediation below, and contact a seasoned New Jersey family law attorney with any additional questions. Have a conversation with your attorney where you establish what you should expect from the mediation and how best to achieve it. Your attorney may suggest that you remain silent for the majority of the mediation, to allow your attorney to do the talking. Also discuss with your attorney what you anticipate that your spouse will want from the mediation. Your mediation has a better chance of being successful if you know what issues you’re willing to compromise on, and which outcomes are worth fighting for. Giving ground on certain issues can help you gain goodwill with your opposing spouse. Also, you may want to ask your attorney what you can expect to spend if mediation fails and you have to go to court to reach a division of your assets and custody arrangement. Learning how much a courtroom divorce will cost might make it easier to concede on certain points, especially financial issues. Unlike with a courtroom trial, you may not be asked to disclose a full financial history prior to a mediation. But it can’t hurt to prepare a full picture of your finances to help the mediator make final decisions about a division of assets. This can help your case to be resolved even sooner, rather than having to return for an additional session. If you’re considering filing for divorce in New Jersey and need skilled and experienced legal counsel on your side, contact the Union law offices of John B. D’Alessandro at 908-964-0102.